In actual dollars, the increase remains a far cry from the $1.3-billion a year that the Naylor report said is needed to bring Canada’s research machine up to global standards. Anyone hoping for a bolder, more transformational move from Mr. Morneau was bound to come away disappointed. But the budget provides a 25-per-cent increase in the category of basic research, which is technically Ottawa’s biggest ever and enough for Mr. Morneau to claim a historic investment in research that is “on brand” for a government that wants to be seen as pro-science. “There are gaps, but they’ve listened carefully and I have a high degree of confidence that in the years ahead we can talk to them about what else would help,” said Dr. Naylor. 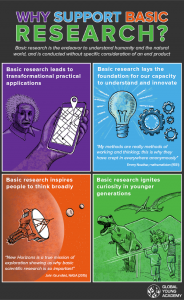 #SupportTheReport became a rallying cry on social media as many scientists mobilised around the country, organising meetings to drum up support for the report’s message, with a special focus on its funding recommendations. 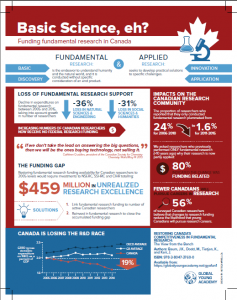 Biomedical and health scientists have been particularly vocal because the squeeze on funding for field-initiated proposals has resulted in steeply declining success rates among investigators reliant on the Canadian Institutes for Health Research (CIHR). The federal government is committing $6.6 billion to foster innovation and science, with $4 billion going to innovation and $2.6 billion going to science. And at the same time, Canada’s venerable National Research Council will get a major makeover. In this commitment, unconstrained, fundamental research — conducted by Canada’s Granting Councils — will receive $1.2 billion, the largest ever injection of cash in Canadian history.